for the 2018 Christmas and 2019 New Year period. This is based on information published by the bus companies, and may change. Always check the services you want to use with the bus company. 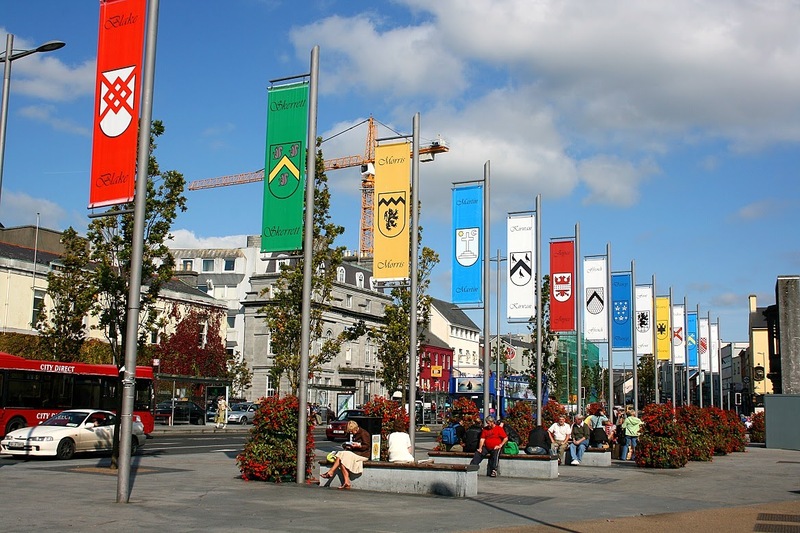 A park-and-ride service will be in place in Galway City for the Christmas 2018 shopping period. 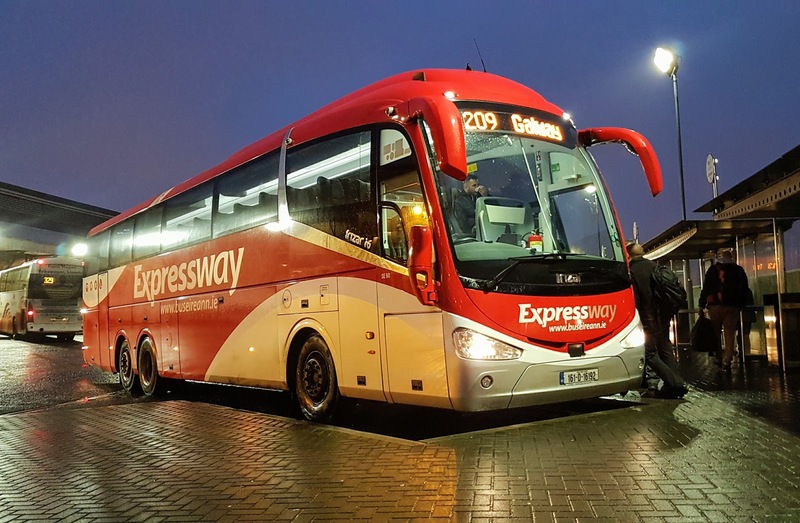 It will run on selected days between Saturday 1 December until Monday 24 December, and is being operated by Callinan Coaches on behalf of Galway City Council. 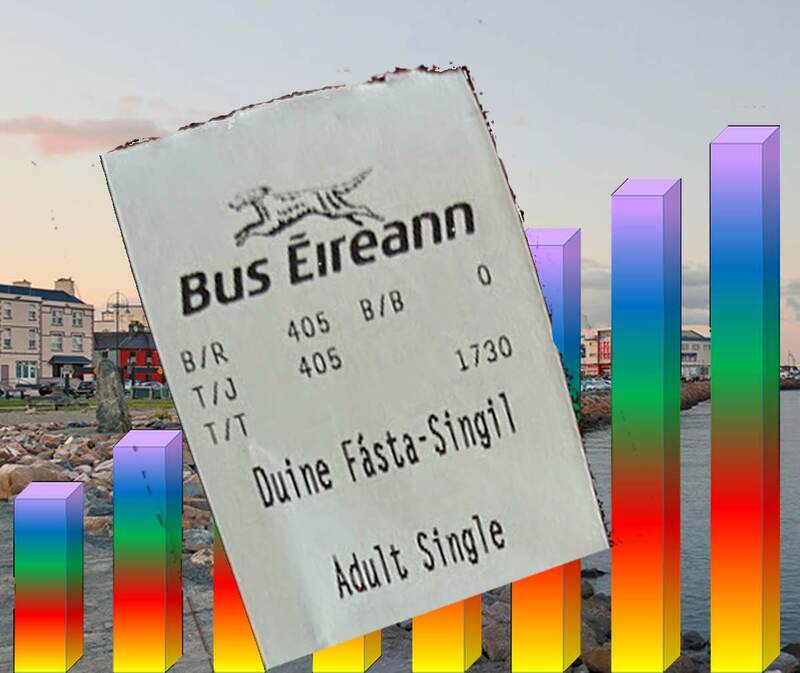 December 2018 public-transport fare increases for Galway have been announced by the National Transport Authority. Full details are in the determination document, which is available here. These fares apply from 1 December 2018, for the 2019 calendar year. Monthly and annual ticket prices will be applied during November for tickets that will be used from December. 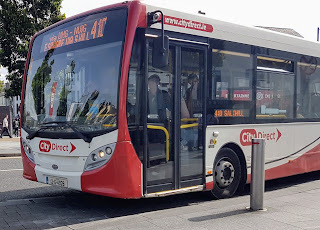 The Galway City Bus Fares page will be updated with this information shortly. 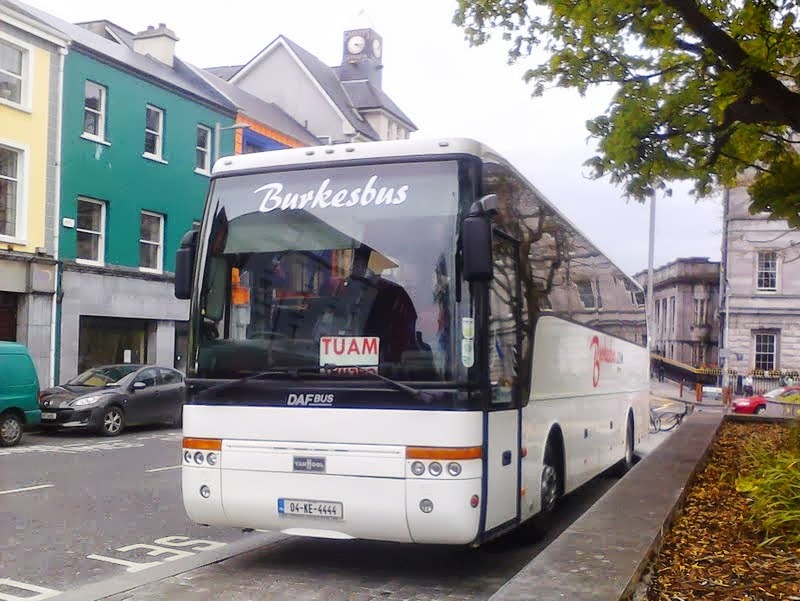 Burkes Buses have announced two new times on route 427 Tuam to Galway, running from 5 November 2018. The company's webiste still lists 5-November as the provisional starting date: it may be best to check with the company that these buses will be running advertised. 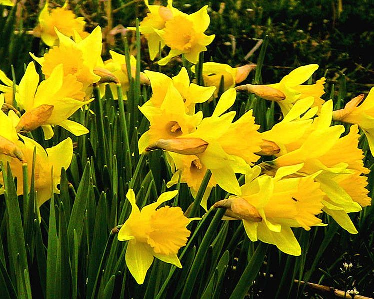 Monday 29 October 2018 is a bank / public holiday in Ireland. 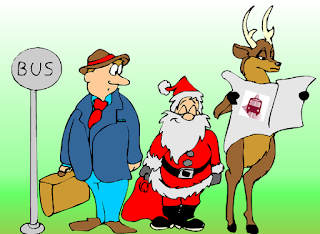 Changes to city and county bus and train services for this weekend are summarised below. Monday 6 August 2018 is a bank / public holiday in Ireland. This means that public services (banks, government offices, processional offices) will not open, and shops, pubs, cinemas etc are likely to open later than usual. Tourist attractions will probably operate according to their normal hours. See below for information about changes to public transport in the region. 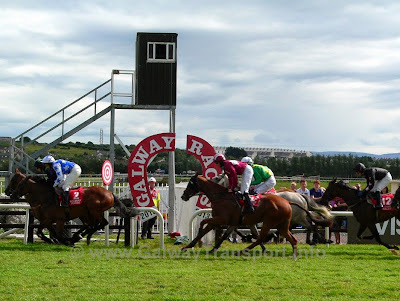 The Galway Races Summer Meeting is from Monday 30 July - Sunday 5 August 2018. This is a summary of the public transport and traffic-management plans. 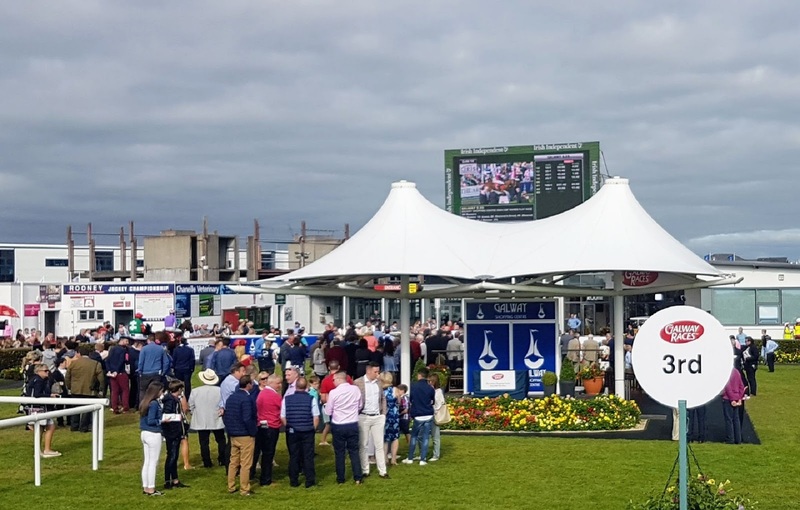 Bus Éireann special races shuttle buses will run from Eyre Square. 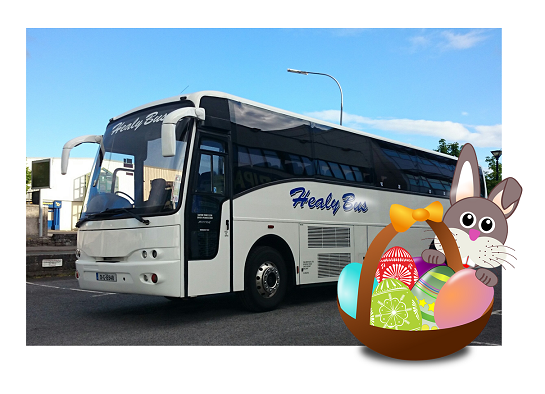 Private bus companies are running special services from various towns and villages. Some hotels are also organising shuttle services. The route 409 - Parkmore and route 403 - Ballybrit / Parkmore Industrial city buses go to the racecourse (Avenue entrance). But there are restrictions during peak racing traffic hours Mon - Fri. There are some changes to regular regional buses during race week and the next week. 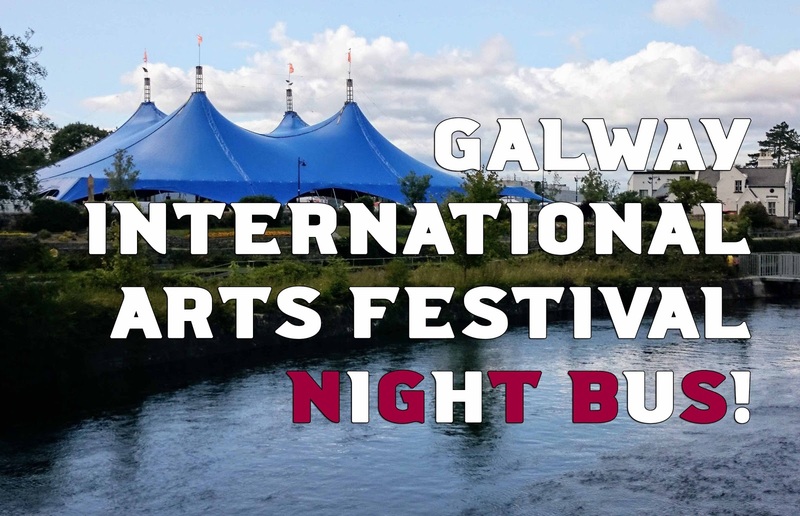 Bus Eireann have announced that they will run a limited number of "night-link" buses for two weekends during the Galway International Arts Festival, 2018. Because the extra buses are running after midnight, they are technically on the day after the one listed. Practically, however, most passengers will still think that it is the day which is shown. The press release does not state explicitly, but presumably these are the times from Eyre Square, and the buses will also run a return journey 1/2 and hour later than the time shown. 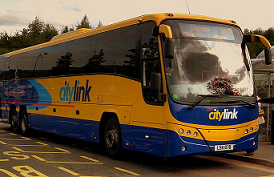 Regular city bus fares apply, including child, student and free-travel passes. See details of Galway City bus fares for more information. The only other after-midnight buses in Galway is the regular Night-link run between Galway and Athenry by BusLink every Friday, Saturday and bank holiday Monday. 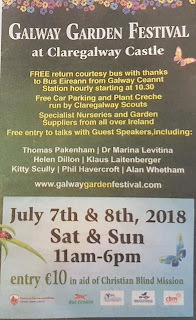 See links to this in the Galway Regional Buses page. City Bus have announced (at 11pm on Sunday 8 July 2018) timetable and route changes for buses 410,411 and 412 timetables - effective from Monday July 9th. Route 411 Knocknacarra via Rahoon Road / Rahoon Cemetery no longer goes to Cappagh Road between 8:15am and 5:15pm from Monday thru Friday. Instead, 411 buses during this time stop at the Western Distributor Road (WDR). 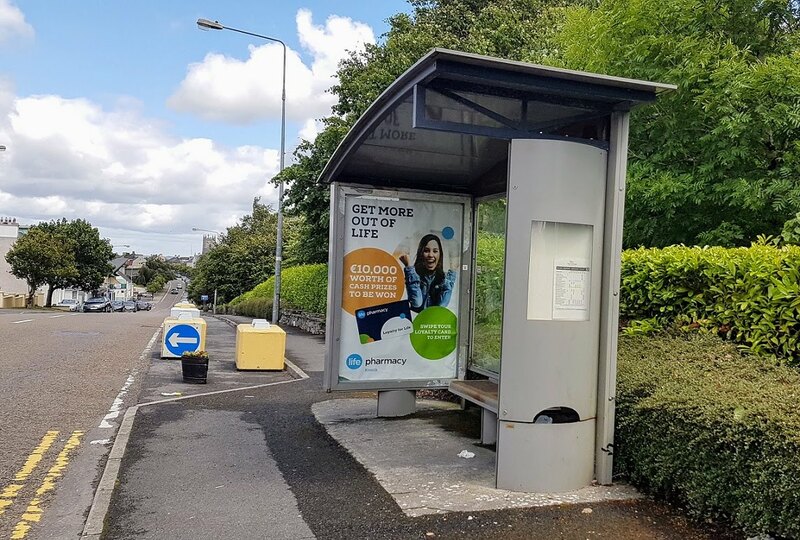 Each route 411 service during this time will leave from the WDR bus stop at the same time they previously left Cappagh Road - the effect is that the bus will run several minutes earlier. 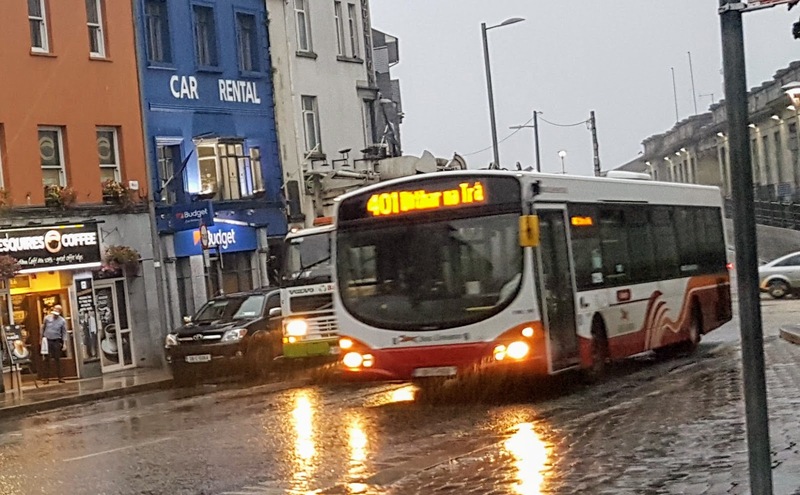 Route 410 - Knocknacarra via Salthill becomes a Monday thru Friday service only. Weekend services are cancelled. Route 412 - Knocknacarra to Eyre Square via Western Distributor Road has one additional bus from Cappagh Road at 5:30pm, Monday to Friday. 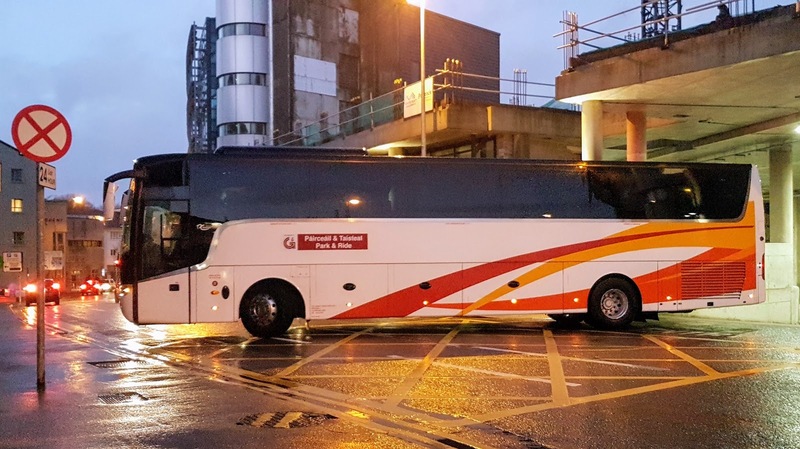 The National Transport Authority is the body which is responsible for licensing bus services, and which will have had to approve these changes. 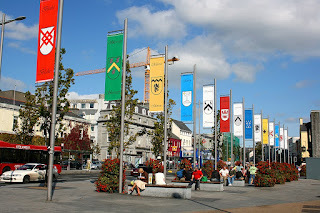 See Galway City Bus Services for information about other services in the area. 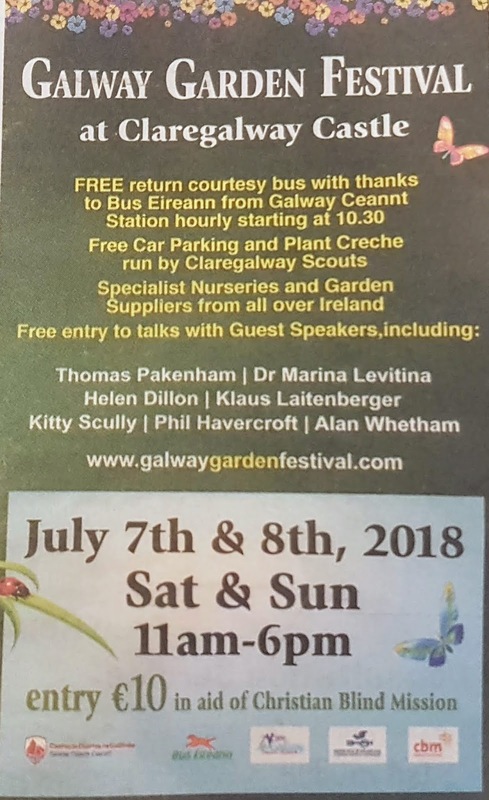 Galway Garden Festival is being held at Claregalway Castle on 7-8 July, 2018, with opening hours from 11am-6pm each day. The castle is on the N17 at Claregalway, and there are likely to be traffic restrictions and delays. Limited free parking is available at the castle. (the printed advertisement says it's a bus once an hour, their website says every two hours). Admission to the castle grounds is €10 per person, and the day is in support of The Christian Blind Mission . Public transport hubs map - locations of the private bus station and Galway Ceannt Railway Station / Galway Travel Centre. 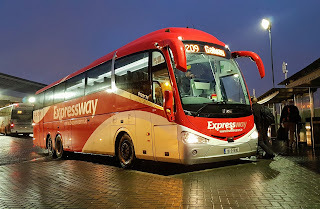 Bus Eireann have announced a number of changes to bus routes and timetables between Galway and Mayo. This is being split into three separate routes, with timetables designed to interconnect. Overall, more towns and villages will be served, although individual bus-stops in some places will no longer be served. The new route 456 Castlebar – Westport – Ballinrobe – Kilmaine – Headford - Galway will have five services each day, with multiple stops. The new timetable is here. 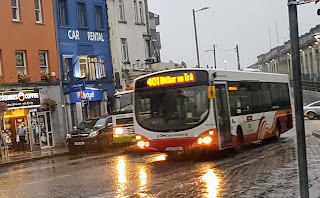 The new route 420 has three services daily from Castlebar to Ballina& via via Pontoon (and various other places) nbsp; the new timetable is here. The new route 422 will have three services daily between Castlebar and Headford via Cong - the new timetable is here. This is a totally new service. The timetable is designed so passengers can connect to other services at Swinford & Claremorris. Fever Pitch music festival is behind held at the former Galway Airport site on 2-3 June 2018. Regular public transport options are very limited: see airport connections to/from Galway for more information. A shuttle bus service is being run from the Sportsground on College Rd by Naughtons Coaches (091 553188). Buses start at 12:45pm each day, with the last return journey at 11:15pm after the last act. Fare is €10 return, and €7 one way, and tickets are available via Facebook. See the College Rd neighbourhood map for information about getting to the bus stop. Note that Naughtons are signatories to the NASA initiative – based on this, it is possible that bookings will not be accepted from people aged less than 18. See Galway Regional Bus services for information about getting to Galway city. 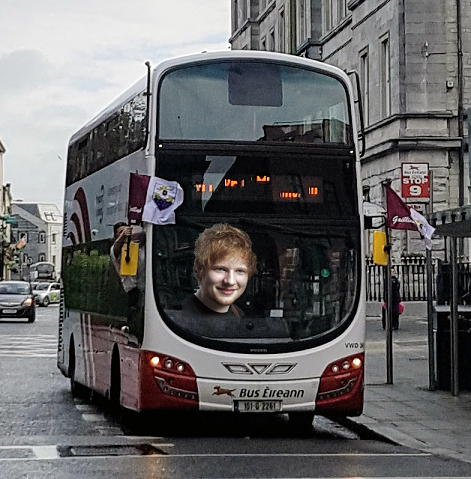 NUIG's Student's Union have announced that they are running a free bus from Corrib Village to the Lidl supermarket on the Headford Road on Monday evenings, starting Monday 26 February 2018. This is similar to the supermarket service which operates in some other Irish cities. It is only open to students (not yet clear if it's only Corrib Village residents, or if other NUIG students can use it), because it not a licensed public bus service. Presumably it will operate during term-time only.